Is the new real iPhone 5, or is it just another prototype? Many sources are confirming that the new iPhone 5 will be a completely new re-design unlike the iPhone 3G and iPhone 3GS. Sources are saying that the new iPhone 5 will not be anything like the iPhone 4 and is going away from the square shape. Instead, the iPhone 5 is said to look like the 2010 MacBook Air’s design. It is said to look like a “teardrop” going from thicker to thinner from the top to bottom. This is jus a prototype because Apple will surely test many different products before the iPhone 5 hits the market. The design looks like the fourth-generation iPod tough. It is very thin and the display is bigger going from 3.5 inches to 3.7 inches, the pixels are staying the same though. The new home button is like a stretched out circle. On the prototype, it may be a gesture-based home button. That has to be just a little bit cool. Apple is also trying to see if they can hide the earpiece and the sensors behind the screen. That will make the iPhone 5 a little cleaner and a little more like the fourth-generation iPod touch. Keep in mind that this information is exactly true. There will continue to be a lot of new iPhone prototypes. This iPhone 5 is what could be the new iPhone 5, but we will not know until Apple itself introduces the iPhone 5. There will be many new sources that come with different designs and dimensions of the iPhone 5. Stay tuned for more information and we will continue to deliver the news. What do you think of the new iPhone 5? Drop a comment below and let us know. 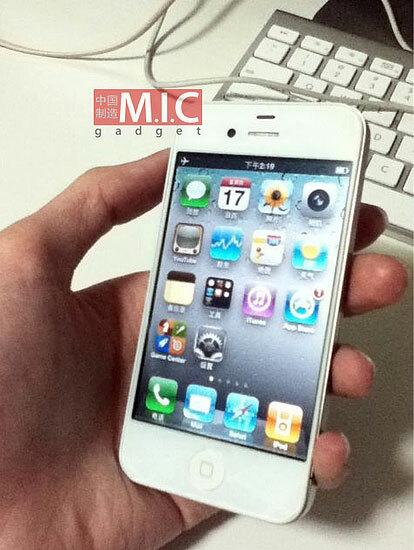 Earlier today by MIC Gadget, shared a picture of the a photo of a white iPhone with the similar body of an iPhone 4, but with a larger screen in the same frame. Though MIC Gadget is unsure of the veracity of this being the next iPhone, it sure doesn’t look like the iPhone 4. See below for a comparison of the comparison of the front panels. 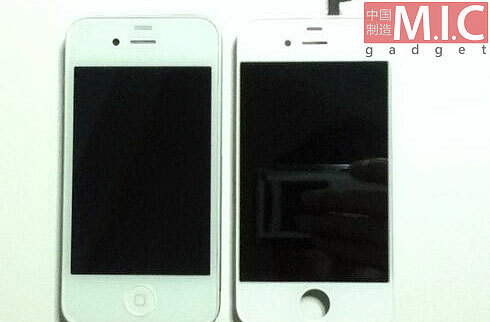 The white iPhone 4, which was supposed to be released in June 2010, has been confirmed to be released this spring. The delay was caused by the leakage of light through the glass plate and onto the camera sensor. Apple declined to comment about the companies that would be the carriers for the white iPhone 4, but Bloomberg reported that both AT&T and Verizon Wireless would get it. It is also highly probable that the iPhone 5 will be delayed. This wasn’t the first time that there was a problem with the iPhone. There were also issues with the antenna causing reception problems. Apple needs to get on the ball. Nobody is happy when there are delays. Punctuality is very important. If people are waiting for the iPhone and it doesn’t come out in time, then they will end up buying a different phone. Are you going to buy the white iPhone 4 or wait until the iPhone 5 comes out? There are many people who are looking forward to the new iPhone 5. With a new Apple product on the look out, rumors are spreading like wildfire. One of the first rumors is that the new iPhone 5 will be made of metal, instead of the aluminosilicate glass used in the iPhone 4. Using metal for the back of the iPhone 5, added to the stainless steel band on the iPhone 4 would make the iPhone 5 completely metal based. Making the new iPhone 5 have a metal back would be much better than using the aluminosilicate glass for the back. The metal is more durable then the glass and wouldn’t shatter. The glass back would also add more weight to the phone and had stress-fracture issue due to sliding cases for the iPhone 4. With a metal back, the new iPhone 5 will be more durable and resilient. It would be similar to how Apple makes its Mac computers with a metal unibody. The metal would be thinner than the glass, so you can have a lighter feel to it. The iPhone 5 is most likely to follow the iPhone 4’s design and continue to have a flat back. There have been some iPhone 5 cases that were leaked to confirm this design. There have also been some rumors that the screen will be 4 inches instead of 3.5 inches. The camera may also improve from a 5-megapixel to an 8-megapixel. Some other rumors are that the iPhone 5 will most likely be available in white, which is highly probably. The iPad 2 has dual-core A5 chips, so the iPhone 5 should also have it. One rumor that is very interesting is that the iPhone 5 will have NFC Technology, or near field communication technology. The iPhone 5 will use NFC to make your iPhone 5 act like a credit card. With all these rumors going around, you have to wonder, which rumors are true and which are false. You have to wait until the iPhone 5 launches to find out, which is rumored to be near June — September. Feel free to leave questions or comments.